YELLOW by Beximco in association with BGMEA University of Fashion & Technology (BUFT) organized ‘Fashion Fest 2019’ in the permanent campus of BUFT located in Ashulia on March 20, 2019. Muzaffar Uddin Siddique, founder and chairman of BUFT, Shehryar Burney, executive director of Yellow, and Professor Eng. Ayub Nabi Khan, Vice Chancellor of BUFT, were present as distinguished guests on the occasion. The event was divided into three segments - workshop on fashion, creative design exhibition and a fashion show. International designers of the fashion house YELLOW conducted the workshop on fashion for the current students of BUFT. 56 highly talented students displayed their creative designs at the exhibition while three top winners were rewarded. YELLOW selected 25 models for ‘YELLOW Fashion Show’ out of 130 applicants. 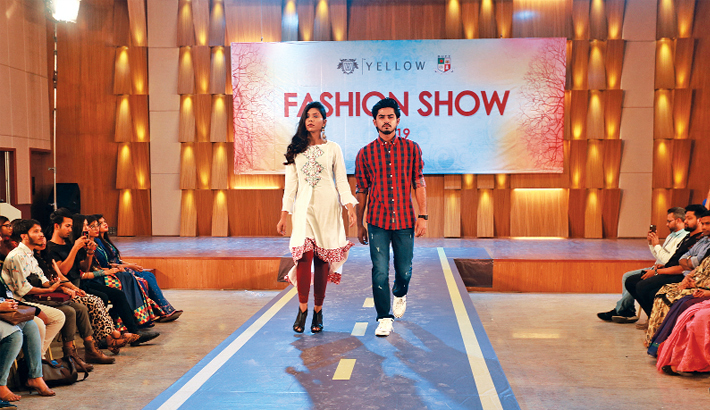 These student models put on YELLOW’s Baishakh and Spring collections. The auditorium was fully packed with more than 300 students, faculty members and invited guests. The purpose of this initiative was to prepare the future leaders of the fashion industry and to engage them in a learning experience with YELLOW team.